In May 2017, a group of scientists and nuclear specialists launched the DIMOS plan, the Dutch Initiative on Molten Salts. (The full plan you find here, a short version is available here– presently in Dutch only.) DIMOS is the plan for an ambitious development project, shaped around the unique opportunity the Dutch have to drastically speed up the international molten salt reactor development. At the basis is a historic coincidence: the presence of a so called ‘pool side facility’ in Petten’s High Flux Reactor (HFR). This makes the HFR suited for a crucial experiment with what one could call a miniature molten salt reactor, called LUMOS, that will be placed in the radiation field right next to the HFR’s reactor core. Starting point for DIMOS was the need to speed up the design process of a responsible energy system, based on a technology that was successfully demonstrated 50 years ago. The perspective of a clean, abundant and affordable energy source has been firmly established, but its implementation demands further development. 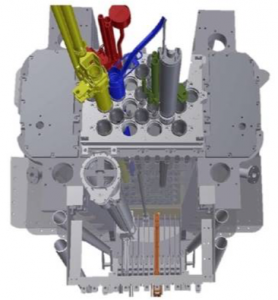 DIMOS’ approach will generate technology spin-offs for European industries, soon after its start – think of new metal alloys, machine manufacturing, chemical industry, automation and robotics. To realize this, top experts, researchers and students will be recruited in this worldwide emerging field of research. The Dutch initiative intends to provide a theoretical and experimental foundation for essential design choices. It also aims at educating highly qualified scientists, engineers and technicians. Of crucial importance is the nuclear qualification of all salts and structural materials needed. The purification processes of the salts will need to be demonstrated. All safety principles and components will need to be tested in conjunction, under representative temperature and radiation conditions – for which the HFR offers unique features. The ultimate goal is to develop a concept design for a future proof thorium-MSR. While other programs choose to work on the reactor design first, DIMOS expressly chooses a different order. From previous experience with reactor designs, it became clear that all materials – which are often well-known, but their behavior in the conditions prevailing in a molten salt reactor is unknown – have what you could call ‘a bandwidth’, that needs to be established: what are the limits for this material if we expose it to high temperature, corrosive components and radiation, simultaneously. This can only be assessed in realistic reactor conditions. Only then, it becomes possible to design the reactor system. If the order is reversed, there is the very real risk that the design imposes demands on the materials that are on the edge of what they can handle. Or maybe over the edge. In that case it is back to the drawing board, and valuable time is lost. The team that is working on molten salt reactors is convinced the DIMOS route will prove to be the fasted route to a responsible energy system that will meet future demands. It is no coincidence that this is also the chosen routefor the development of the Molten Chloride Fast Reactor of Terrapower, the nuclear company of Bill Gates – although Terrapower’s loop test does not include neutronics. Also, Terrapower at this time does not seem to pursue the thorium cycle – meaning that DIMOS at present seems the only initiative that proposes a feasible route to a molten salt reactor that is able to start the thorium cycle. Starting the thorium cycle is one of the ultimate goals of the DIMOS plan. The fact that the HFR test-reactor and the Pool Side Facility are already available, means a substantial reduction of the time that is required for development and a substantial cost saving. At the heart of the DIMOS initiative is the design and construction of what could be called a miniature molten salt reactor, named LUMOS (Learning to Use MOlten Salt). In its essence, LUMOS is a loop-shaped tube, in which a nuclear fuel salt circulates within a radiation field. The construction will be build and tested in a non-nuclear environment first. 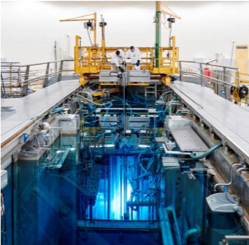 Once LUMOS has successfully completed all tests, it will be placed on the HFR’s unique ‘Pool Side Facility’, a test platform in the radiation field right next to the reactor core of the High Flux Reactor. The loop containing the fission salts consists of three separate layers: closest to the salt is Hastelloy, a nickel alloy, next is steel, and the outer layer is aluminum. of a nickel alloy. This not only provides redundant safety layers, the construction also makes it possible that the salt in the inner loop will be far hotter than the lukewarm water of the reactor pool, that is in contact with outer tube. The neutrons from the HFR will start fission reactions in the fuel salt. Thus, important experiments can be performed under realistic conditions in a relatively straightforward manner. Precise measuring equipment will register everything. In this way, LUMOS will allow the scientists to build up essential knowledge of a working nuclear system. This method will save much time and cost in the development process of a molten salt reactor. At this moment, NRG, the Dutch Nuclear Research and Consulting Group in Petten, Netherlands, is in the process of designing the LUMOS setup. Experiments with irradiation of fuel salts and structural materials have already started: in August 2017, the first molten salt samples have been placed in the reactor core of the HFR, a series of tests with the name SALIENT. First results are expected in 2019. The scanty research budget that the researchers presently have, is by no means sufficient for building the LUMOS facility. Execution of the DIMOS-initiative will require an estimated yearly budget of 20 million euro’s. For this small budget, we could make a crucial step towards a truly clean worldwide energy system. Although operating in a neutron field, LUMOS is not a critical system, which distinguishes it from a real reactor.